The sacraments are seven great gifts that God has given to us. Although we cannot see it, each time a person receives a sacrament, special grace comes through God to that person. These graces help us to reach heaven. 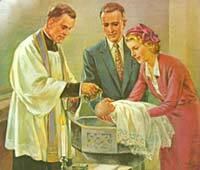 Baptism is the first sacrament a person receives, and is the only one that we have to have to go to heaven.